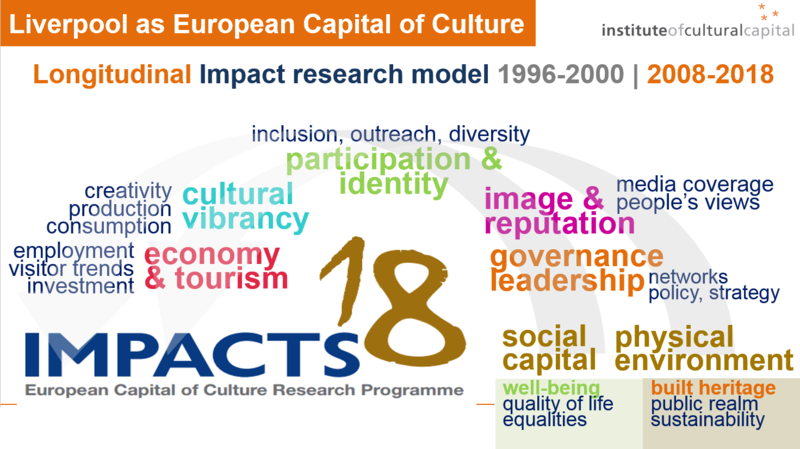 Impacts 18 is a longitudinal research programme dedicated to capturing the long-term effects of hosting the European Capital of Culture title on the city of Liverpool. We held an International Symposium on the 18-19 October 2018. Using the data baseline and methodological framework established by the Impacts 08 research programme — a ground-breaking five-year study on the economic, environmental, social and cultural impacts of Liverpool 2008 that concluded in 2010 — the project will produce a unique retrospective on the effects of hosting an ECoC which, spanning over 20 years, will be one of the most ambitious and wide-ranging of its kind. The project is led by Dr. Beatriz García, who has researched the multiple impacts and long-term legacies of cultural interventions on ECoC host cities and other major event host cities since 1998. Dr García has led research on the only two UK-based EcoCs to date (Liverpool and Glasgow), as well as two leading international ECoC comparator projects funded by the European Commission and the European Parliament. All of these projects provide an unmatched baseline for the current research programme. The Impacts 18 project has benefited from kick-starter funding from the AHRC Cultural Engagement Fund as well as funding from Culture Liverpool, University of Liverpool, Liverpool John Moores University and the ICC Endowment Fund. Secondary data and new fieldwork against each of these themes is being analysed with a view to determining how durable the effects of the ECoC on these areas have been in the time that has elapsed since 2008. Impacts 18 | Cities of Culture, 30 years on: Who has the edge? Culture Liverpool, the CreArt network of European cities and the British Council.